Have you seen Fifty Shades of Grey yet? Well if you have the urge to smack something with the back of a spoon, may I recommend a pomegranate? 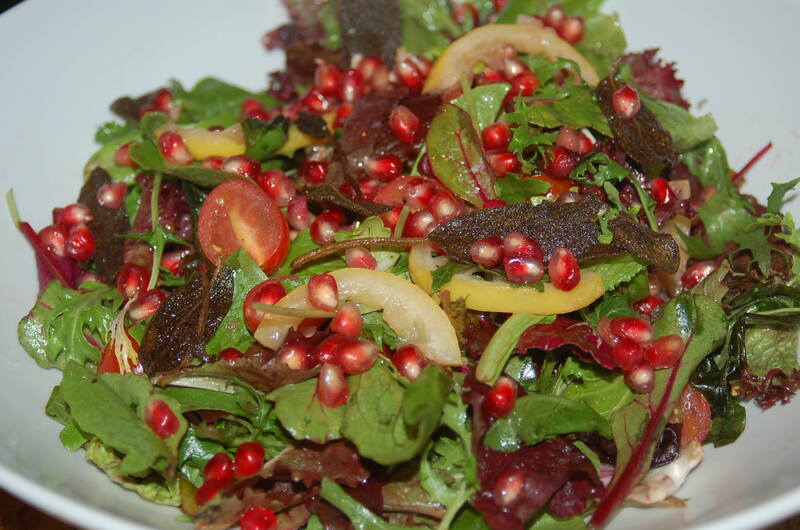 You can then add the luscious pomegranate arils (seeds) to my Pomegranate and Roasted Lemon Salad. Winter’s fruits, the pomegranates and lemon together in a salad create a burst of bright flavors with every bite. The lemon contains as much vitamin C as an orange and is one of the most nutrient dense fruits. The rind contains the most nutrition. Blanching then roasting the lemon eliminates the bitterness. The pomegranate contains anti-inflammatory phytochemicals and antioxidants. Studies suggest the pomegranate fruit may help prevent or alleviate heart disease and atherosclerosis; high cholesterol; prostate cancer; and Alzheimer’s disease. Wash the lemons well then slice one lemon into thin rounds. Place the lemon slices into a pot of boiling water. Blanch the lemon slices for 2 minutes. This will eliminate the bitterness from the rind. Remove the lemon slices from the boiling water and lay on a baking sheet lined with aluminum foil. Coat the lemon slices in 1 tablespoon of olive oil then roast for about 10-15 minutes until they start to caramelize a little. Allow the lemon slices to cool slightly, then cut the slices in half. In a medium bowl, toss the mixed greens, tomatoes and red onion slices in the dressing. Transfer to a serving bowl. Decorate the top of the salad with the lemon slices and pomegranate arils. Add either grilled or poached chicken to make this a meal. This salad also accompanies a big bowl of soup nicely.